General consensus so far seems to be that “Black Panther” is one of, if not the best, movie in the Marvel cinematic universe. This consensus is entirely accurate. Not only is it one of the best Marvel films, but almost every aspect from characters to aesthetics is the best that has come from a Marvel film. Following the death of his father in “Captain America: Civil War,” Prince T’Challa (Chadwick Boseman) is crowned king of Wakanda. As this is happening, an enemy (Andy Serkis) from the isolated nation’s past reappears alongside a figure with unknown intentions. What is nice about “Black Panther” is that T’Challa was already introduced in “Captain America: Civil War,” so it gets to act as a Black Panther origin story without going through the overdone and traditional super hero origin story, and instead could focus on T’Challa as a character and his origin as the new ruler of the most advanced country on the planet. Throughout the movie he is faced with issues both political and personal that will help to build his character. Alongside T’Challa, every character of any amount of importance has some amount of character depth to them. The main villain (Michael B. Jordan) has a well-developed philosophy, engaging back story and he feels like a believable person, making him Marvel’s best villain so far. All of the side characters have different personalities and ideas to differentiate them, and none of them seem superfluous. To go along with the well written characters, all of the actors are great. Boseman and Letitia Wright, who plays T’Challa’s sister, have wonderful chemistry and come off like they really are brother and sister. Lupita Nyong’o, Forest Whitaker and Daniel Kaaluya are all wonderful as well, and Andy Serkis is nothing short of entertaining in every scene he is in. Due to how well written the characters are, it makes the action scenes stand out even more. The movie has a number of action set pieces that have a range of locations and it never feels like the audience is viewing the same fight twice, even when two of the fight scenes happen in the same location for similar reasons. What adds to these action scenes is that not only are the character developed to the point where the audience cares about their well-being, but, unlike other Marvel movies, there is an actual sense of dread that one or more of the characters will not survive an action sequence. There is also a brutal realism to it all. Not only does it feel like any character could die at any time, but the reasons for conflict in the movie are based on topical talking points and current issues. In terms of aesthetics, the movie is wonderful and unique. The main city of Wakanda is an original design, all of the costumes are colorful and pop on screen and other than scenes that take place in South Korea, the settings are all unique to the Marvel universe. Another nice thing about “Black Panther” is that it takes every chance it gets to also develop the fictional country and culture of Wakanda. The movie gives the audience a lot of details about Wakanda, showcasing the country’s politics, technology, its current standing with the rest of the world and its history without ever bogging the flow of the movie down. Everything is worked in organically, and it ultimately results in believable characters in a believable setting. A potential issue that “Black Panther” deals with well is with Wakanda’s natural resource, Vibranium. 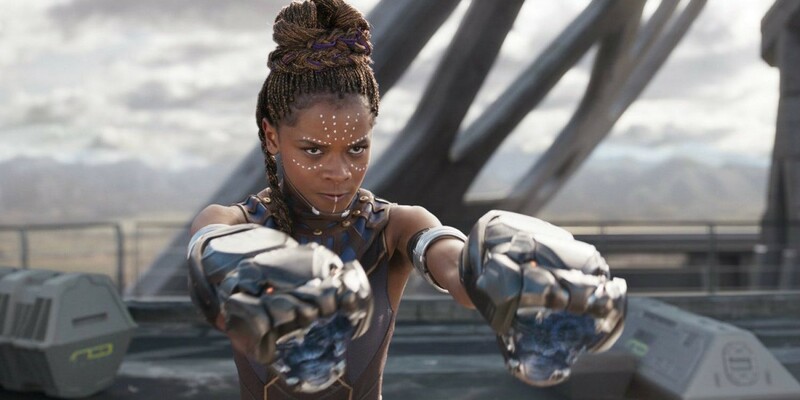 Vibranium has all sorts of different functions from medical purposes to weapons manufacturing that the movie could have fallen to using it as a product used for plot progression, but it manages to make the use of it logical so that it never feels like it is being used as a cheap way to make things happen in the movie. “Black Panther” also manages to avoid traps that other Marvel movies have fallen into. The comedy in “Black Panther” is rather laid back, with the majority of it happening at times where it tonally fits and does not damage any of the tension that has been building up in a scene. There are only a few instances of humor being used to defuse tension, and in both cases they work due to the setting, what is happening in the scene and because of the character who is speaking. The one area of the movie that falters is the story, and it only falters to a mild extent. In terms of story-telling, everything that is set up, whether obviously or subtly, has a satisfying pay-off to it, the pacing is well done, and the storyline mostly manages to avoid predictability. That being said, there was one instance where a giant coincidence for the sake of plot progression happens, and it seems like there is some needed closure for a few characters who do not receive any. Almost everything about “Black Panther” is at its apex, even the obligatory Stan Lee cameo which is one of the best and funniest ones yet. It is simply fantastic.